Escape reality with an idyllic countryside retreat at our Bed and Breakfast Otterburn hotel, William De Percy. Situated in the heart of Northumberland on the Scottish borders, you will be 31 miles from Newcastle Upon Tyne, making it just under an hours travel into the city. Whether you are spending your weekend with us or enjoying a midweek village style break, we ensure you an enjoyable and relaxing stay no matter the weather. William De Percy is located in a small village called Otterburn not far from the main attractions that Northumberland has to offer such as the National Park, historic landmarks, shops, cafes and parkland walks. Our bedrooms at William De Percy are all boasting with personality. From our petite to deluxe rooms, no two bedrooms are of the same style; they all exude an individual mix of traditional and quirky modern interiors designed with luxury for a cosy getaway. Providing tech comforts such as super-fast WiFi in every room and complimentary Netflix you will feel right at home with us. Your four-legged friends are always welcome to stay with us at William De Percy and their happiness and comfort is just as important to us as our human guests. With the breathtaking countryside of Northumberland, any canine companion with four legs and a wet nose will be in paradise with the selection of walks you can go on and all of the new smells they can explore before settling down for a well deserved nap in our hotel. We also welcome your pooch into our restaurant and pub too so that you can both enjoy a drink and a bite to eat after your adventures. Our breakfast, standard and Sunday lunch menus are all boasting with delicious hearty food with an edge. With everything from a full English breakfast to start your day, to our Catch Of The Day to experience “the biggest fish the boat could safely land” to sweet treats such as a Honeycomb Crepe and Sticky Toffee Pudding and the best Sunday Lunch that Northumberland has to offer – both you and your furry friend will be sure to find something to make your tastebuds tingle by booking a table with us today.  If you like the sound of what we are about here at William De Percy then don’t delay in booking your visit and contact us today. We look forward to welcoming you!